This Chateau is owned by the Mahler-Besse family, owners of Chateau Palmer in Margaux and many other first-class winemaking properties in Bordeaux and around the world. 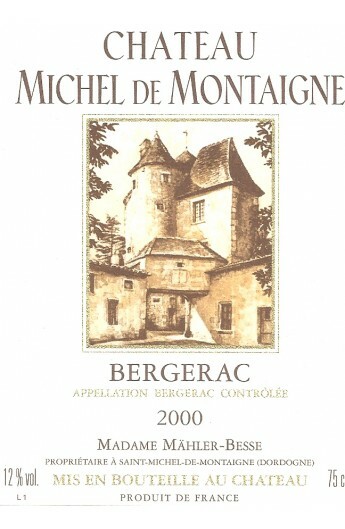 In 1964 they rebuilt this historic Bergerac property which lies less than six miles from the village of St. Emilion. The terroir is identical to right bank Bordeaux and so the vineyards hold 60% Merlot, 20% Cabernet Franc, and 20% Cabernet Sauvignon on clay and marl soils and the vines average 20 years of age. The Chateau Michel de Montaigne excels in this great vintage: presented well-colored and powerful, the tannins are present without excess. The bouquet being borne out, its powerful but silky mouth leads to predict a potential of very interesting ageing.